Today’s Mystery: What Is an Egg? Caitlin Dewey reports that this restriction has been on the books since at least 1977, but has no idea why. So this is today’s question: Why is the FDA prohibited from regulating the food commonly known as eggs? Are any of my readers old geezers who used to work at the FDA? Or maybe you know someone who fits the bill? Or perhaps you’re a historian of egg regulations? If so, please chime in! 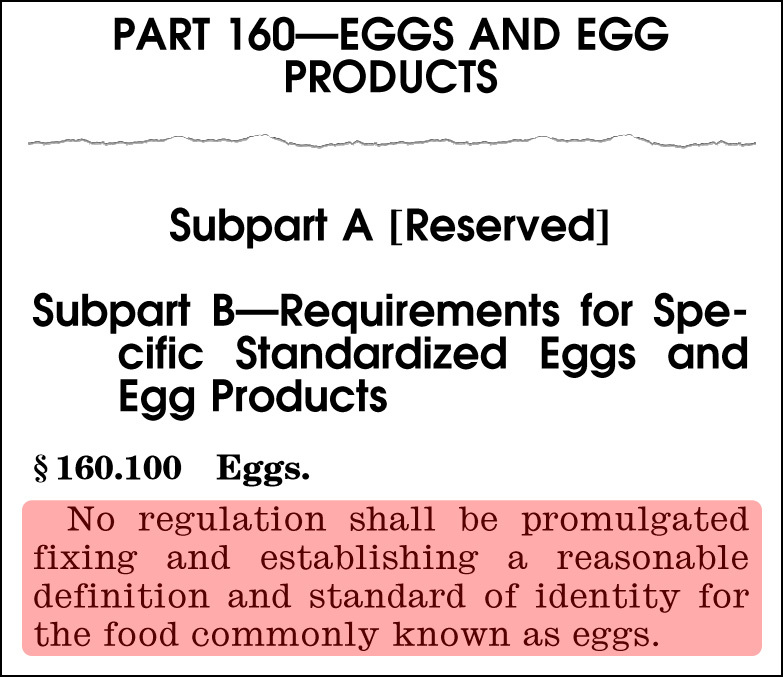 The non-definition of egg dates back to 1939, when the FDA, in its infinite wisdom and following what must have been a truly egg-citing public hearing, decided that “it was deemed more suitable to include within each definition and standard for liquid, frozen, and dried manufactured egg products a definition of the term ‘eggs’ as that word is employed in its relationship to the manufactured product, rather than to establish an individual definition and standard of identity for eggs as a separate food.” See 4 Fed. Reg. 3377 (attached/highlighted), adding what was then 21 CFR 42.000. Was this the result of lobbying from the manufacturers of “liquid, frozen, and dried manufactured egg products”? Maybe! There’s clearly more digging to be done here. However, it’s also possible that there was no real controversy back then over the meaning of “egg,” so they just decided to skip it.